One of the biggest reasons why I chose to take this course was out of pure interest. An English course focused on technology? Sign me up! I was mostly intrigued on the idea of how Humanities, and English specifically, contributed to aspect of technology. Growing up, I always saw English as merely the study of history through literature, with high school as the biggest offender; William Shakespeare, Edgar Allen Poe, and Charles Dickens were merely seen as names to recognize with the occasional passage or two that needed to be read. Naturally, coming to Geneseo as an English major, this perspective quickly changed as I began to understand what the study of literature actually entailed. Despite this, I kept the mentality that computers were in a whole other ballpark than English. In fact, some of my classes reinforced this idea, with nearly all of my professors banning technology during class time, and all of them requiring physical copies of the texts we planned to use, the separation of the humanities and technology became normalized for me. Depending on your definition, I could either be very knowledgeable about my computing skills, or a complete novice. I was never particularly savvy with the inner workings of a computer or its base functions. The most complicated function I have been able to accomplish, previous to this course, was to use the command line to find and connect the Public Toshiba printers to my laptop so that I could print from anywhere. As someone who grew up playing video games, I am much more proficient in using software than anything else when it comes to using a computer. Perhaps one of my favorite things to do in a video game is to add a modification to it. All mods are made by the community of people who play the game and depending on the popularity of the game, there can sometimes be hundreds, if not thousands, of unique mods made by different people. A great example of this is a game from the popular series, ‘The Elder Scrolls’, Skyrim. This game, which is a fairly typical role playing game set in the standard fantasy setting. In this game there will be a variety of non-playable characters including, people, monsters, and animals. 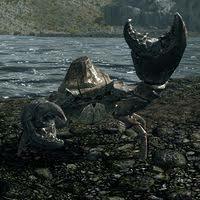 One such animal is the ever-so-famous mudcrab. 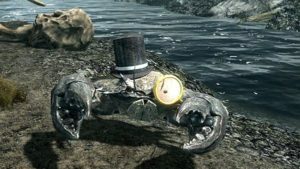 As can be seen below, one of the many mods you can install takes the crab and make him seem much more…sophisticated. As I have mentioned before, I play a lot of video games. Some people have game consoles, however I play a majority of my games on a computer and so have become very attached to my laptop. I care for my laptop much in the same way that someone would feel towards a stuffed animal or an old blanket. It is for this reason that I am always hesitant to take my laptop out of my room, especially when it’s for a class. Having my laptop be damaged or stolen is a fear that always creeps into the back of my mind whenever it is in a place that isn’t deemed secure by me.